In a Star Wars VII trailer, we see a stormtrooper flung into the air from an explosion. The motion of the stormtrooper will provide information about the planet on which the scene occurs. The supplemental documents folder contains a Tracker experiment file with the video analysis of the stormtrooper's motion as described in the Wired magazine Dot Physics blog. The goal of the analysis is to estimate the stormtrooper's acceleration. A Tracker experiment file (*.trz) that includes the video clip of the stormtrooper explosion described in the Dot Physics blog. A description of the physics used in the stormtrooper video analysis. R. Allain, Computer Program STORMTROOPER EXPLOSION (2015), WWW Document, (http://www.wired.com/2015/05/video-analysis-exploding-stormtrooper/). R. Allain, Computer Program STORMTROOPER EXPLOSION (2015), <http://www.wired.com/2015/05/video-analysis-exploding-stormtrooper/>. Allain, Rhett J.. "Stormtrooper Explosion." http://www.wired.com/2015/05/video-analysis-exploding-stormtrooper/ (accessed 22 April 2019). 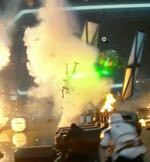 Allain, Rhett J.. Stormtrooper Explosion. Computer software. 2015. 22 Apr. 2019 <http://www.wired.com/2015/05/video-analysis-exploding-stormtrooper/>.